Homeopathy is an alternative medicinal field which is been practiced for more than 200 years. Homeopathic treatments are based on the principal that 'like cures like'. Ruta Graveolens is such a homeopathic medicinal plant. Ruta Graveolens is a strongly scented evergreen shrub which has many homeopathic medicinal uses. The leaves and oil are used in many beverages. It is widely used as an insect repellent because of its strong pungent smell. The oil is used as a fragrance ingredient in cosmetics such as soaps, creams & lotions. Ruta Graveolens contain a number of active compounds such as flavonoids, alkaloids, coumarins and essential oil. Rutin, a flavonoid makes it a good remedy for eye problems. Alkaloids and Coumarins present in it have antispasmodic action. It is an excellent remedy for pain and soreness in the bones, joints, tendons, and cartilage. It is used as a first-aid treatment for sprains, injuries, strain, bruises, pulled ligaments. 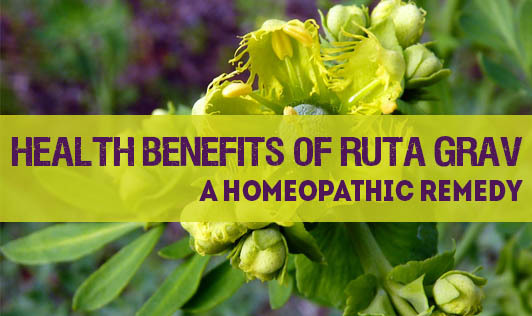 Sprains or fractures can also be well treated using Ruta Graveolens. It is a good remedy for lower back pain. It is also a useful remedy after surgeries involving tendons, connective tissue, cartilage, joints, and coverings of the bones. It eases discomfort if deep stiffness is felt in joints and muscles after surgery.